WASHINGTON -- Tensions are rising, fingers are pointing and the search for solutions is becoming increasingly fraught. 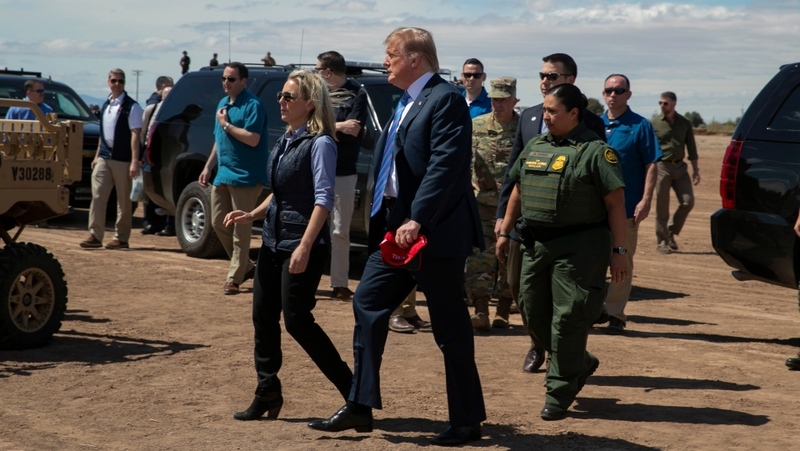 Overwhelmed by an influx of migrants at the U.S.-Mexico border that is taxing the immigration system, President Donald Trump is grasping for something -- anything -- to stem the tide. Immigration experts say Trump's own immigration policies have caused so much chaos along the border that they may be encouraging illegal crossings. The furor over family separations last summer helped to highlight the fact that families won't be detained for long in the U.S. if they're detained at all. And metering, in which people are asked to return to a busy port of entry on another day to seek asylum, may have encouraged asylum-seekers to cross illegally, said Andrew Selee, president of the Migration Policy Institute, a nonpartisan think-tank . Whatever the reasons for the migrant surge, there is a growing consensus that federal border resources are overwhelmed. While illegal border crossings are still down sharply from their peak in 2000, they have nonetheless reached a 12-year high. While most illegal border-crossers used to be single Mexican nationals coming to the U.S. in search of work, more than half are now parents and children who have travelled from Central America to seek refuge in the U.S.
Those families, along with unaccompanied children, are subject to specific laws and court settlements that prevent them from being immediately sent back to their home countries. Immigrant processing and holding centres have been overwhelmed, forcing officials to dramatically expand a practice Trump has long mocked as "catch and release."